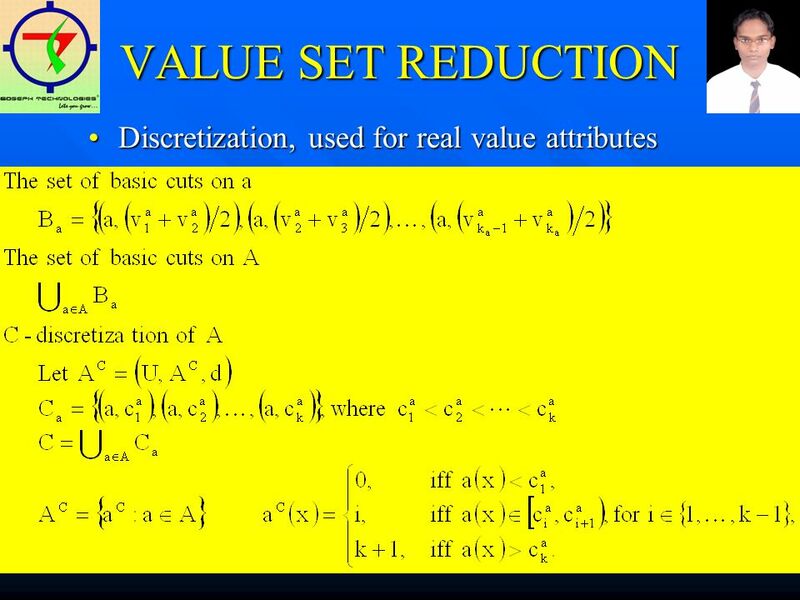 2 INTRODUCTION A rough set is a formal approximation of a crisp set (i.e., conventional set) in terms of a pair of sets which give the lower and the upper approximation of the original set. The lower and upper approximation sets themselves are crisp sets in the standard version of rough set theory, but in other variations, the approximating sets may be fuzzy sets as well. 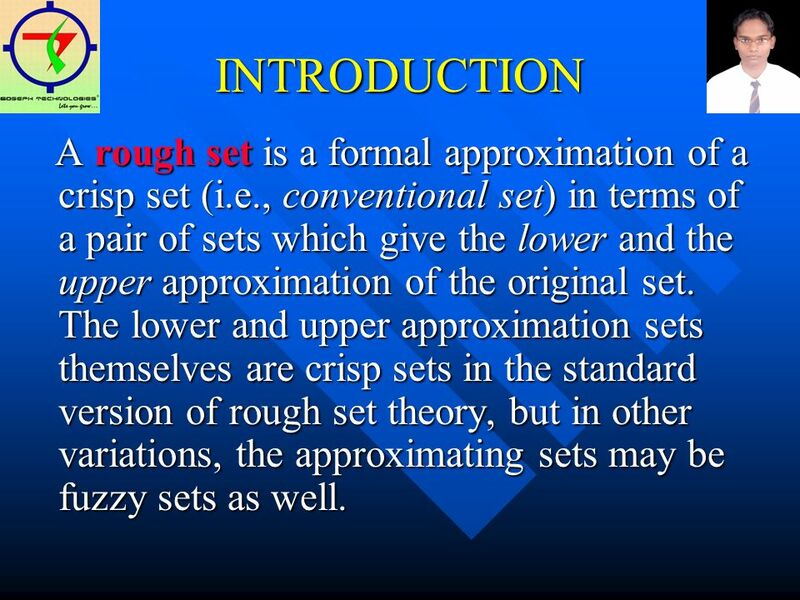 A rough set is a formal approximation of a crisp set (i.e., conventional set) in terms of a pair of sets which give the lower and the upper approximation of the original set. The lower and upper approximation sets themselves are crisp sets in the standard version of rough set theory, but in other variations, the approximating sets may be fuzzy sets as well. 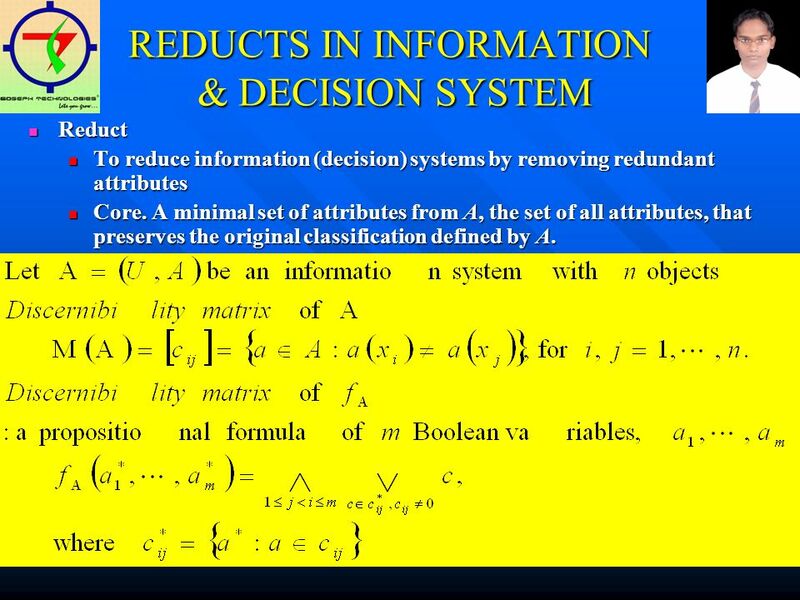 10 REDUCTS IN INFORMATION & DECISION SYSTEM Reduct Reduct To reduce information (decision) systems by removing redundant attributes To reduce information (decision) systems by removing redundant attributes Core. 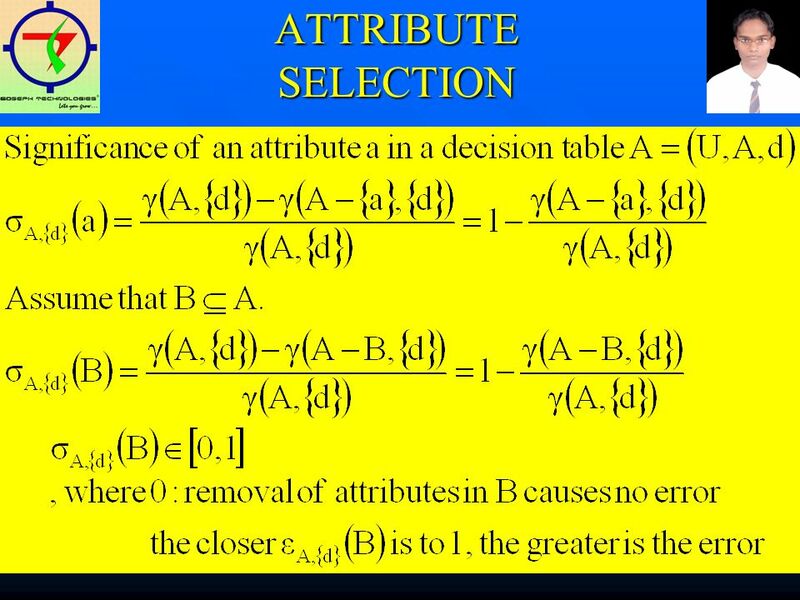 A minimal set of attributes from A, the set of all attributes, that preserves the original classification defined by A. Core. A minimal set of attributes from A, the set of all attributes, that preserves the original classification defined by A. 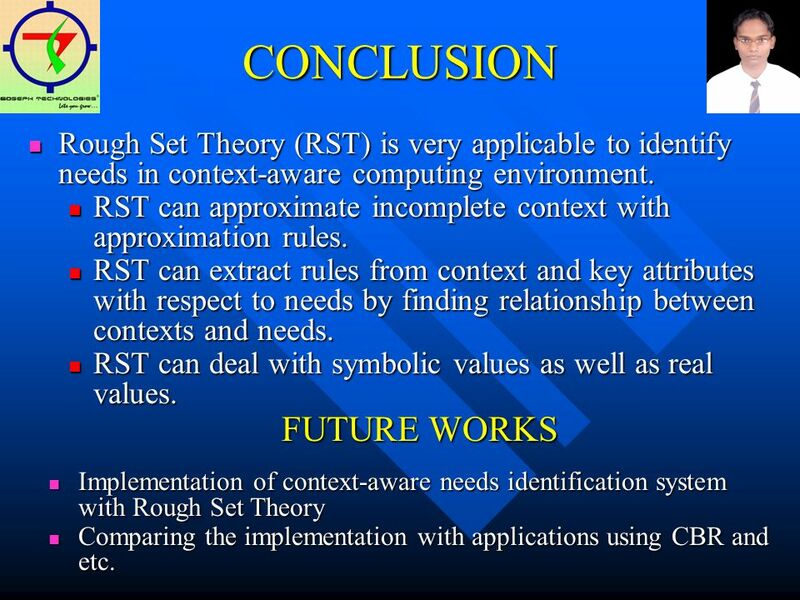 14 CONCLUSION Rough Set Theory (RST) is very applicable to identify needs in context-aware computing environment. 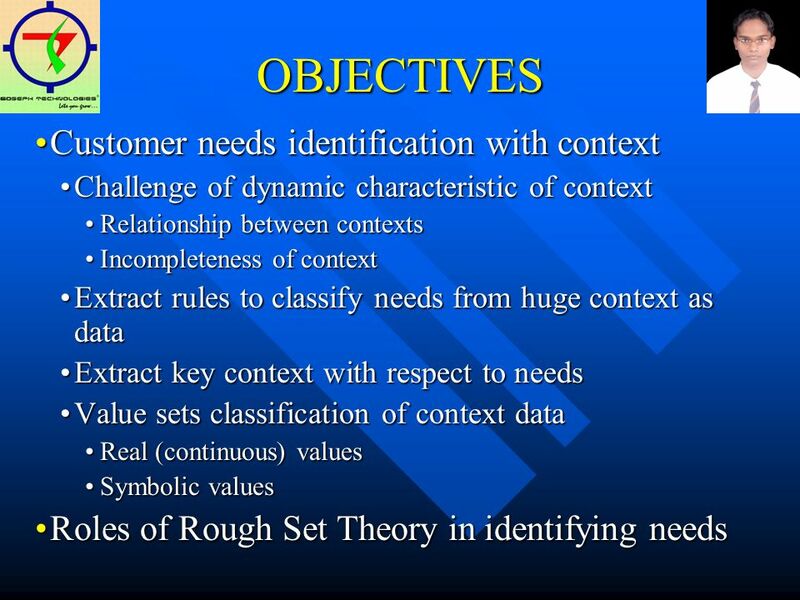 Rough Set Theory (RST) is very applicable to identify needs in context-aware computing environment. RST can approximate incomplete context with approximation rules. RST can approximate incomplete context with approximation rules. RST can extract rules from context and key attributes with respect to needs by finding relationship between contexts and needs. RST can extract rules from context and key attributes with respect to needs by finding relationship between contexts and needs. RST can deal with symbolic values as well as real values. RST can deal with symbolic values as well as real values. 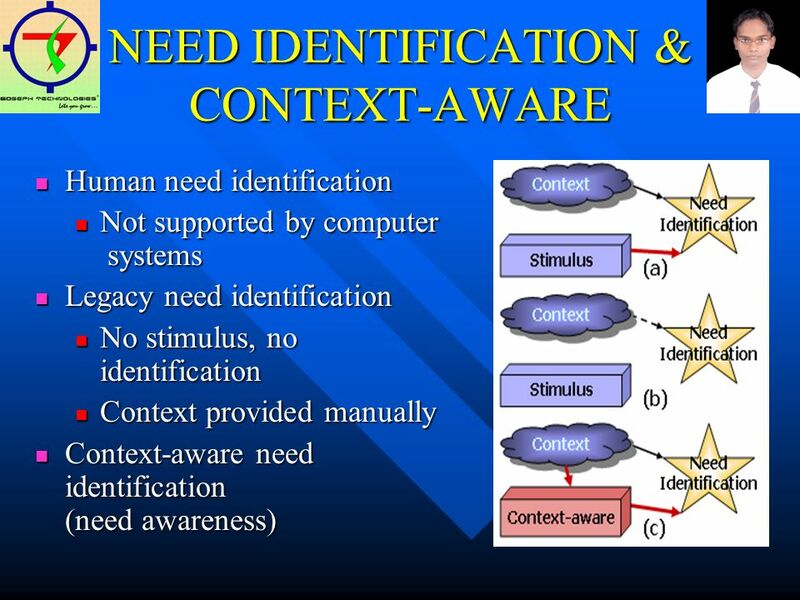 FUTURE WORKS Implementation of context-aware needs identification system with Rough Set Theory Implementation of context-aware needs identification system with Rough Set Theory Comparing the implementation with applications using CBR and etc. Comparing the implementation with applications using CBR and etc. 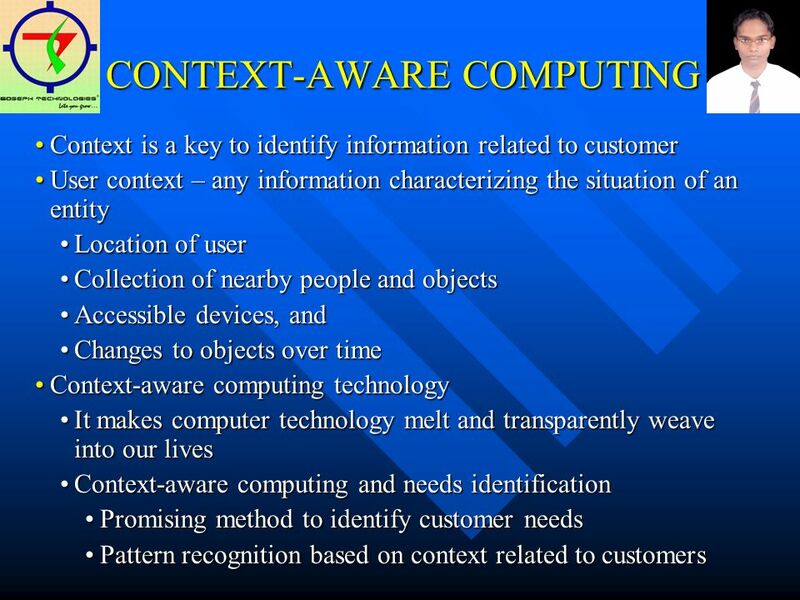 Download ppt "ROLE OF ROUGH SET THEORY IN CUSTOMER NEED IDENTIFICATION IN CONTEXT-AWARE COMPUTING IN ASSOCIATION WITH"
Recommender System A Brief Survey. 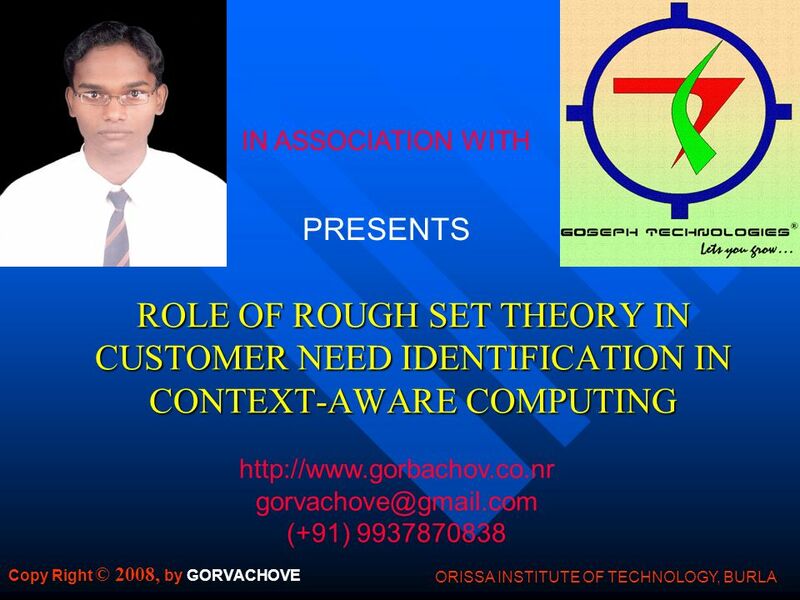 Rough Sets in Data Mining CSE5610 Intelligent Software Systems Semester 1, 2006. Mathematics Domain California Preschool Learning Foundations Volume 1 Published by the California Department of Education (2008) Mathematics. _ Rough Sets. 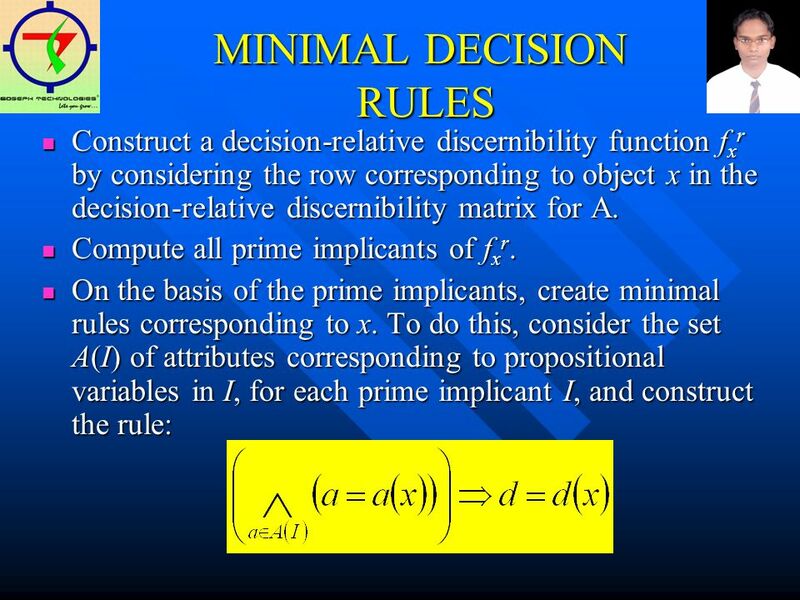 Basic Concepts of Rough Sets _ Information/Decision Systems (Tables) _ Indiscernibility _ Set Approximation _ Reducts and Core _ Rough Membership. Feature Grouping-Based Fuzzy-Rough Feature Selection Richard Jensen Neil Mac Parthaláin Chris Cornelis. 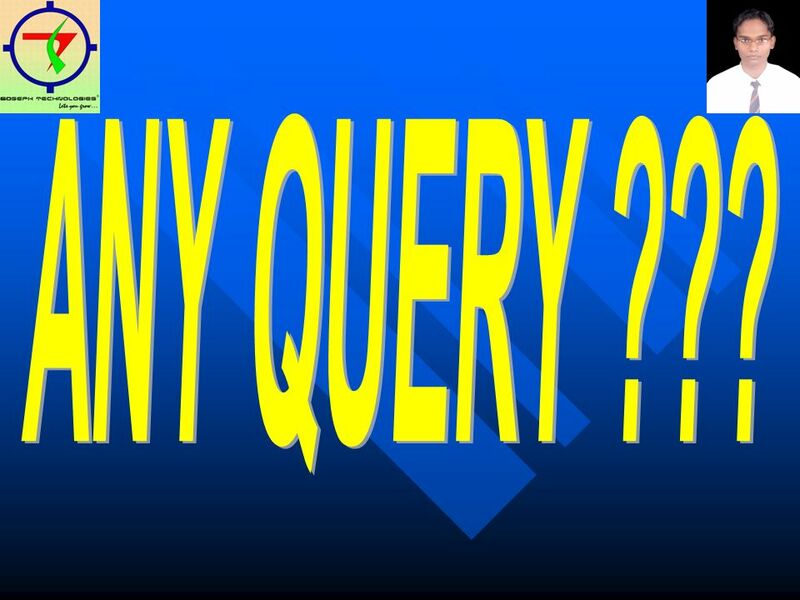 Affinity Set and Its Applications Moussa Larbani and Yuh-Wen Chen. 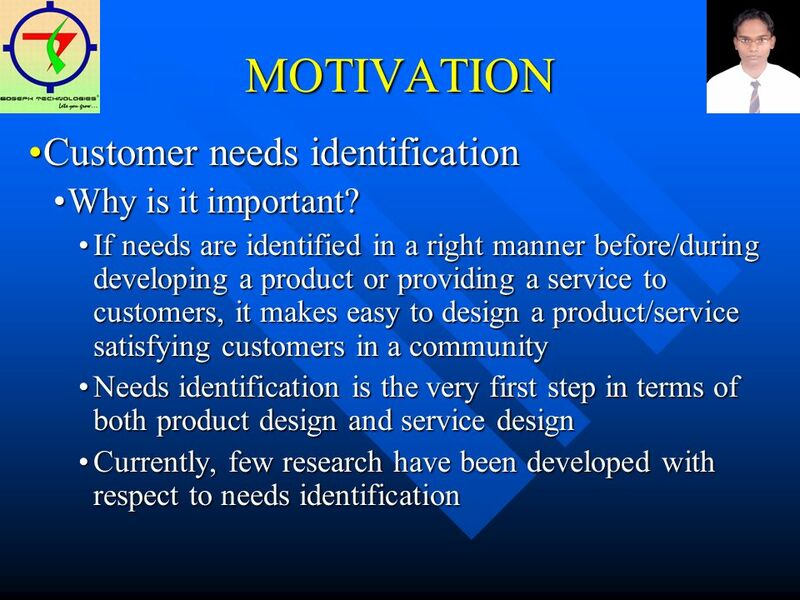 Fuzzy Sets and Applications Introduction Introduction Fuzzy Sets and Operations Fuzzy Sets and Operations. Huge Raw Data Cleaning Data Condensation Dimensionality Reduction Data Wrapping/ Description Machine Learning Classification Clustering Rule Generation. ISBN Chapter 3 Describing Syntax and Semantics. Data Mining Glen Shih CS157B Section 1 Dr. Sin-Min Lee April 4, 2006. 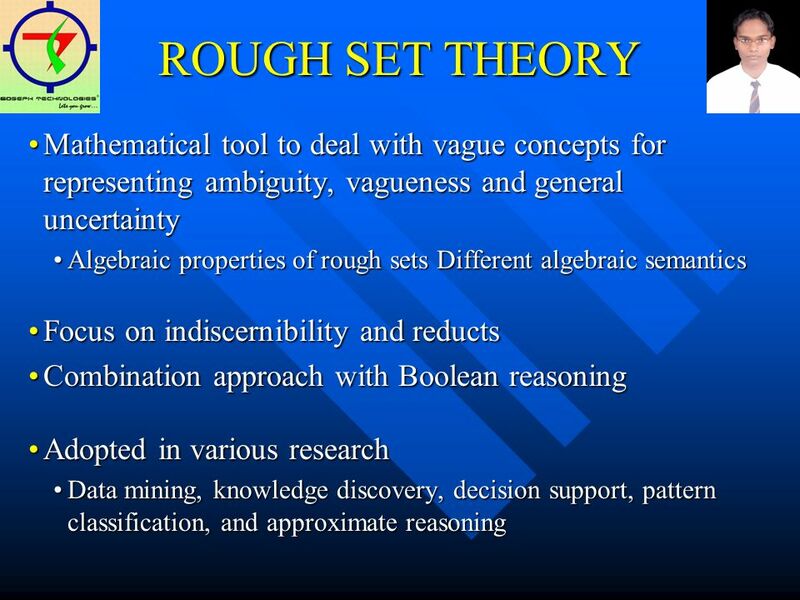 Rough Sets Theory Speaker：Kun Hsiang. WRSTA, 13 August, 2006 Rough Sets in Hybrid Intelligent Systems For Breast Cancer Detection By Aboul Ella Hassanien Cairo University, Faculty of Computer. _ Rough Sets. 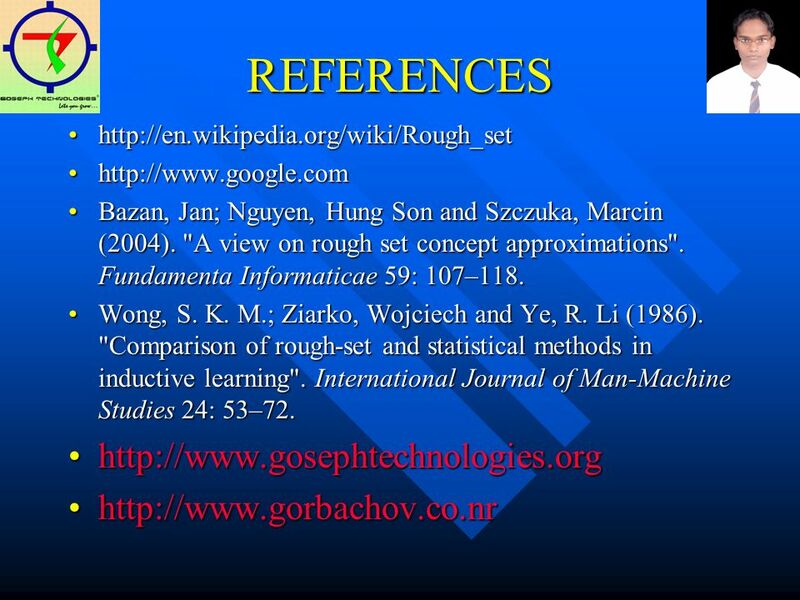 Basic Concepts of Rough Sets _ Information/Decision Systems (Tables) _ Indiscernibility _ Set Approximation _ Reducts and Core. 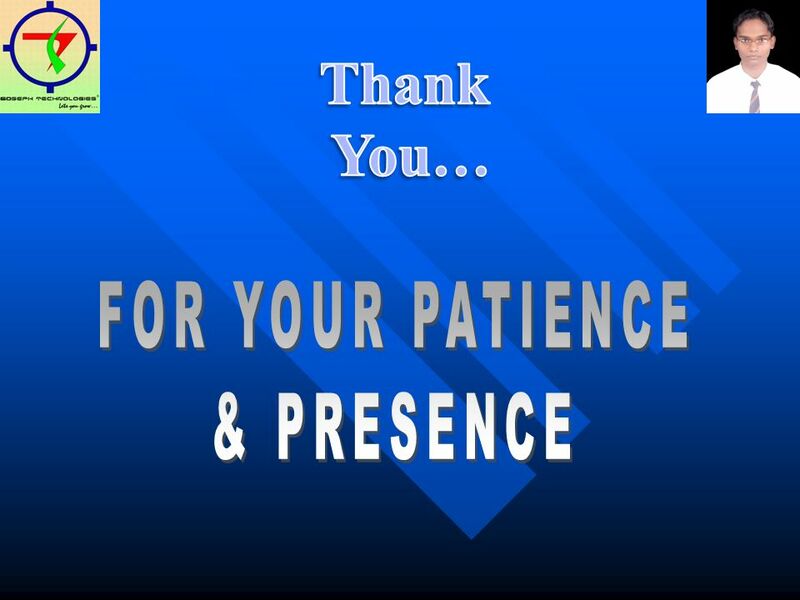 Report on Intrusion Detection and Data Fusion By Ganesh Godavari. ©2001 CBMS Math Preparation of Teachers Teachers need to study the mathematics of a cluster of grade levels, both to be ready for the various ways in which. Mining Hierarchical Decision Rules from Hybrid Data with Categorical and Continuous Valued Attributes Miao Duoqian, Qian Jin, Li Wen, Zhang Zehua. August 2005RSFDGrC 2005, Regina, Canada 1 Feature Selection Based on Relative Attribute Dependency: An Experimental Study Jianchao Han 1, Ricardo Sanchez.